I’m pleased to announce the progress of the Api-Mote Base. This platform was designed with a number of thoughts (enumerated below) in mind, as well as experience from both lab-research and field assessments. A test run of 15 boards have been received and most are populated. An initial firmware version based on the GoodFET project is completed, thanks to a quick port by Travis. KillerBee support will be provided. So why a new device? Almost three years after beginning to work with IEEE 802.15.4 and ZigBee research and security assessments, I’ve gotten tired of the hardware available to interact with these protocols. There are a number of tools out there — but none that I’ve worked with support a few core criteria. Of the hardware that we currently support in the KillerBee project, the Atmel RZUSBSTICK requires a custom programmer, does not support battery power, and lacks an external antenna connection. The TelosB/Tmote Sky/etc provide battery power, expansion, and USB programming, but are no longer in production and use an outdated MSP430 microprocessor and FTDI chip. Further, the inclusion of humidity, temperature, and light sensors are nice for some development, but are unneeded in the base design if the focus is on RF research, security, etc. For similar reasons, as well as availability and cost, I’m not enthusiastic about the Z1 mote for this type of research. Finally, the soon-to-be-released Kisbee from Mike Kershaw will offer some nice sniffing capabilities, but some research techniques as Packets-in-Packets and Packets-out-of-Packets take advantage or registers exposed in the CC2420. Don’t get me wrong — all of that hardware has it’s place — even for use with the KillerBee project. But, as I’m developing new capabilities and proofs-of-concept for assessments, something new was needed. 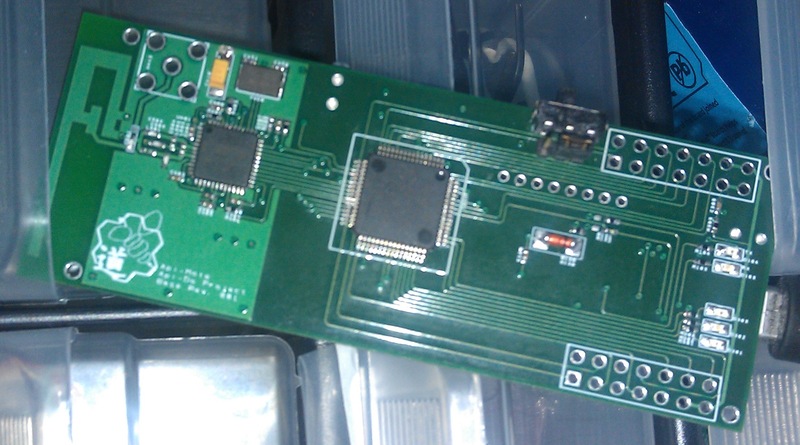 The prototype boards are in the hands of firmware developers and RF engineers. If you are interested in helping, please let me know ASAP. Further, if this sounds interesting to you, please let me know so I can gauge interest in a future run. Please request via http://rmspeers.com/contact/pcb-requests (or if you can’t put up with a form, reach me directly). The copying of the PCB design/functionality is strictly forbidden. Also, it is forbidden to sell products based on this device without first obtaining written permission (don’t worry, we don’t bite). Collaboration, however, is always more than welcome. So toss any ideas, suggestions, complaints, or offers of assistance at me and we’ll figure out how to make things work out for you. This entry was posted in My Work, Security Research by admin. Bookmark the permalink.